Summary: By using Microsoft SharePoint Designer 2010, you can customize and build solutions for Microsoft SharePoint Online, such as powerful workflows and robust data views. By using Microsoft SharePoint Online, a component of Microsoft Office 365, you can build collaborative sites and applications. SharePoint Online lets your employees manage and share important documents and insights with colleagues, customers, and partners; keep teams in sync; and manage important projects—all without the need to manage your own hardware and software. To learn more about SharePoint Online, see Online services: SharePoint Online. Within SharePoint Online, you can create numerous site collections, as shown in Figure 1, for individual projects, company portals, various business units, or areas delegated for external sharing. You can also create individual subsites for teams. SharePoint Online enables users to delegate at all levels of administration. An administrator can delegate ownership of a site collection to a separate site-collection owner, who can create subsites and delegate ownership to site owners. 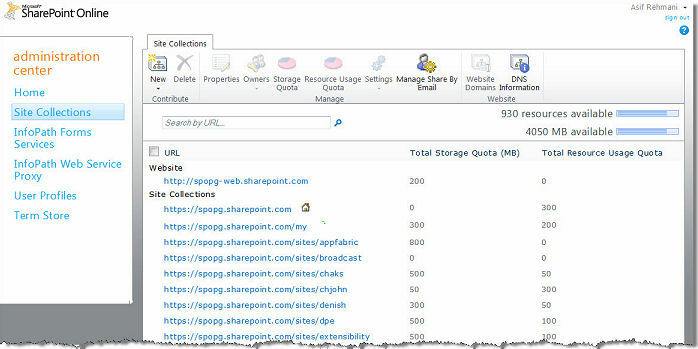 In SharePoint Online, users can allocate their available storage space across a maximum of 300 site collections. (A site collection consists of one top-level site and its subsites.) Site collections are often based on departmental boundaries. My Sites (personal site collections) do not count against the number of site collections. In this article, you can discover opportunities to customize and enhance SharePoint Online by using Microsoft SharePoint Designer 2010. Several books and many resources on the web can help you explore the many capabilities of SharePoint Designer 2010, so this article points out those resources along the way. You can download SharePoint Designer 2010 from the Microsoft Download Center. The previous version, Microsoft Office SharePoint Designer 2007, does not work with SharePoint Online. Just like Microsoft SharePoint 2010, SharePoint Online is a platform on which to build business applications. Features such as the security framework, lists, libraries, and site templates simplify your work as you create solutions. Before we dive into SharePoint Designer 2010, let's quickly explore how SharePoint Online relates to in-browser customization and to Microsoft Visual Studio extensibility. The first level of customization is the kind of configuration you can achieve by using a browser. Site owners and designers of a site can accomplish tasks such as creating subsites, managing site security, adding and customizing default Web Parts, and creating and managing lists and libraries. Furthermore, users designated as site-collection owners can access all subsites in a site collection and can manage the features of the whole site collection directly in the browser. They can configure search settings, manage the second-tier site-collection recycle bin, modify site-collection audit settings, and more. We don't discuss in-browser configuration in this article, but we do recommend that you explore this important capability. SharePoint Online provides both server and client object models for developers. Visual Studio 2010 provides a range of specialized templates for creating sandboxed solutions that contain a variety of SharePoint items, such as site and list definitions, workflows, Web Parts, event receivers, and content types. Creating sandboxed solutions is a fast and secure way to extend SharePoint features and functionality. Developing solutions by using code is the most flexible and powerful option. However, this power is balanced by the need to have the people with the proper skills and then to support that code throughout its life cycle. This approach is potentially costly, time consuming, and resource intensive for simple or intermediate solutions that you can create without the need for custom code. To discover more about creating solutions by using Visual Studio, see the SharePoint Online Developer Resource Center. And, of course, you can use SharePoint Designer 2010. The tasks that you perform in SharePoint Designer are generally known as customizations instead of development because those tasks require you to create or edit SharePoint items declaratively, instead of using server-side code. When you use SharePoint Designer 2010, you are editing directly against the selected SharePoint Online site. This differs from developing SharePoint solutions in Visual Studio 2010, where you create and debug your solution on a local SharePoint installation, and then deploy the completed solution to the Solution Gallery in SharePoint Online. SharePoint Designer 2010 is a powerful application, so you need the capability to restrict that power. After you specify the users in your company who have permission to create new sites, edit list settings, and administer sites, SharePoint Designer 2010 is a great tool for those individuals. If someone else installs SharePoint Designer 2010 on his or her computer (for example, a user with Contribute permission level), that user cannot open any sites within SharePoint Online. This is an implicit restriction that exists in SharePoint Online as well as any on-premise deployment of SharePoint 2010. To put it simply, SharePoint users who do not have the Design or Full Control permission level cannot customize SharePoint sites by using SharePoint Designer 2010. You can also restrict certain aspects of SharePoint Designer 2010 based on the needs of your organization. See Restrict Control later in this article. For a comprehensive understanding of SharePoint Designer 2010, read the book Beginning SharePoint Designer 2010, published by Wrox Press. You cannot use SharePoint Designer 2010 to create a site collection. 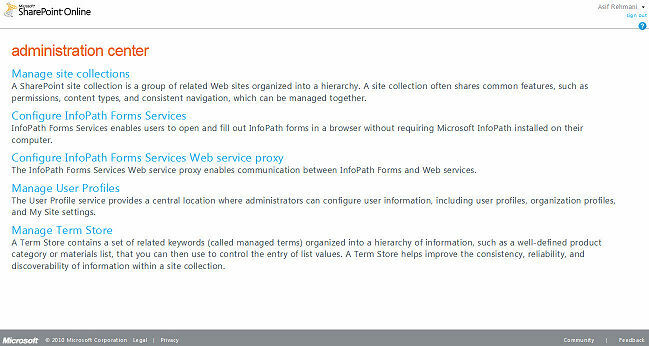 Instead, you must use the SharePoint Online Administration Center, as shown in Figure 2. After you create a site collection, you can use SharePoint Designer 2010 to open and customize any site in the site collection. 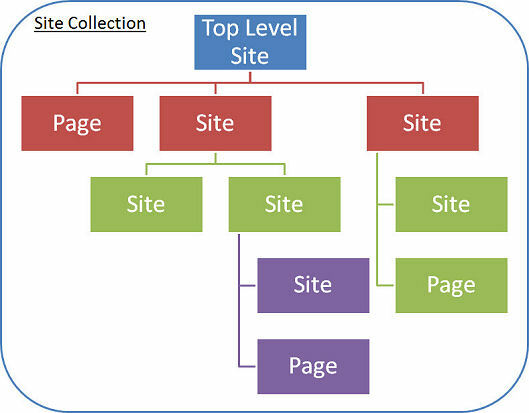 When you have a site collection available, the next task is to create a subsite hierarchy (Figure 3). If you need only a single site, you can create it by using the browser. 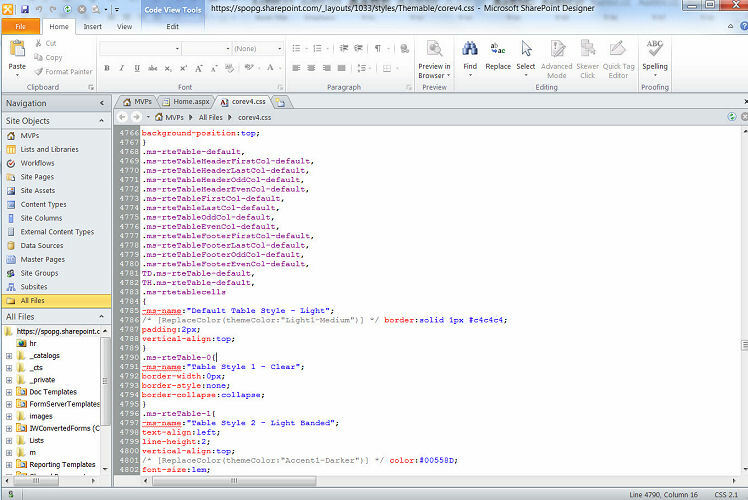 However, if you need to create multiple sites quickly, SharePoint Designer 2010 is a much better option. You can choose from a multitude of site templates for your subsites (Figure 4). 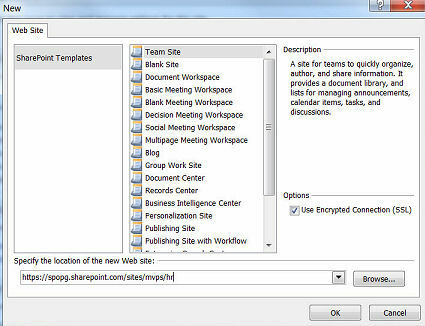 In fact, all the site templates available in SharePoint 2010 are also available through SharePoint Online. When you create a site, keep the URL name of the site short, and do not include any spaces. After you create the site, you can set the title of the site to be as long and as easy to understand as needed. When you use SharePoint Designer to create a subsite, the initial name assigned to that site is the name of site template that you used to create it. Thus the first thing that you should do is use the summary view page in SharePoint Designer 2010 (Figure 5) to give the site a proper title and optionally add a description. Next, you should determine the navigation-pane settings for the site—whether to display Quick Launch, the Tree View, or both in the navigation pane. Even though SharePoint Designer lets you show both of them in the navigation pane, doing so is generally a bad idea because your users will see duplicate information. For example, the users of your site might see links to the Tasks list in both Quick Launch and the Tree View and not realize that both links go to the same list. To add to the confusion, another big difference between the two navigational components is the fact that you as a site administrator can decide which links you want to show or not show in Quick Launch, but this type of configuration does not exist in Tree View. If a member of the site has access to a particular list or library, she sees the link to it in the Tree View. Learn the differences between the two options before you decide which one you should use on your site. Before you can authorize a person or security group to access a SharePoint Online site by putting it into the SharePoint group, that entity must first exist in Office 365. Employees of the company who are enabled to use Office 365 and SharePoint Online appear in the main Office 365 Administration Portal and have individual user subscription licenses (USLs) assigned to them. In addition, you can provide site-collection access to a person who is external to your company and thus allow her to collaborate directly with personnel in your company. The external sharing capabilities in SharePoint Online enable a site-collection owner to simply invite external users to view, share, and collaborate on their sites. The external users have access only to the site collection to which they are invited. First, of course, you must purchase the license subscriptions for your users. (See Buy subscriptions for your company.) When you have the licenses you need, you can get your users into Office 365. 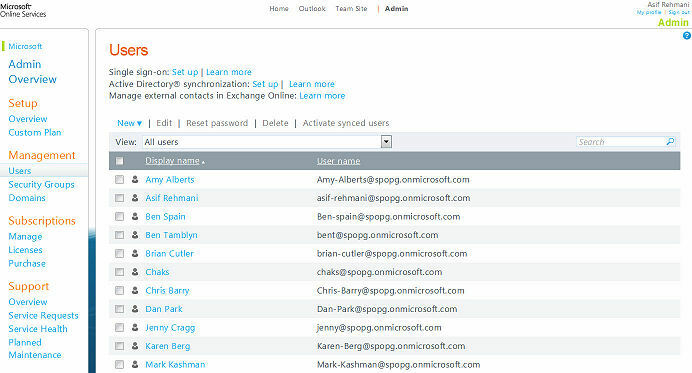 The easiest way to add your users is simply to add them individually by using the user-management screen (Figure 6) in Office 365. Alternatively, you can use the bulk-import feature, which enables you to import users directly from a comma-separated values (CSV) file. Customers of Office 365 for Enterprise can also federate their instance of the Active Directory directory service to synchronize and authenticate their employee access. To add or remove users and security groups and sync your local Active Directory service to Office 365, you use the Microsoft Online Services Directory Synchronization Tool. This allows your company IT administrators to keep your local Active Directory continuously synchronized with Office 365 while maintaining authentication token providership—which means that your users can use their existing credentials to log on Office 365. The process to authorize users within SharePoint Online sites is exactly the same as in an on-premise deployment of SharePoint 2010 and can be done by a SharePoint Online site owner using the browser or SharePoint Designer 2010. Configuring site security through SharePoint Designer 2010 is faster than through the browser. However, both methods work just fine. 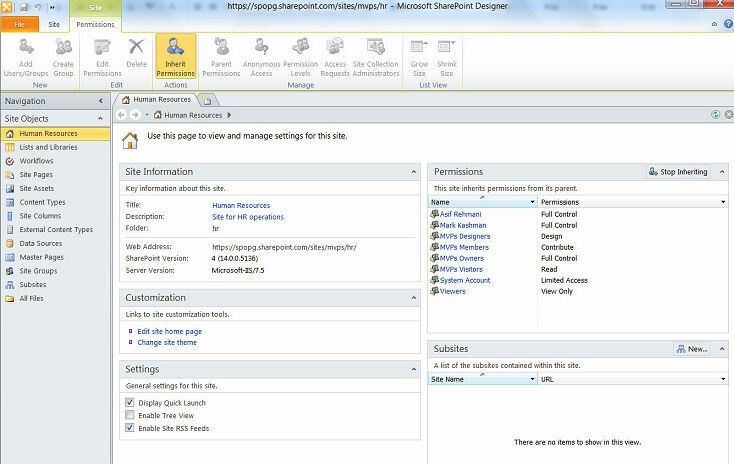 In SharePoint Designer, the permissions for the site are shown directly on the main site-summary page, as shown in Figure 7. Through this interface, you can create SharePoint Online groups for the site collection, add users and security groups, assign permissions, and more. See the following resources for information on how to configure these objects. 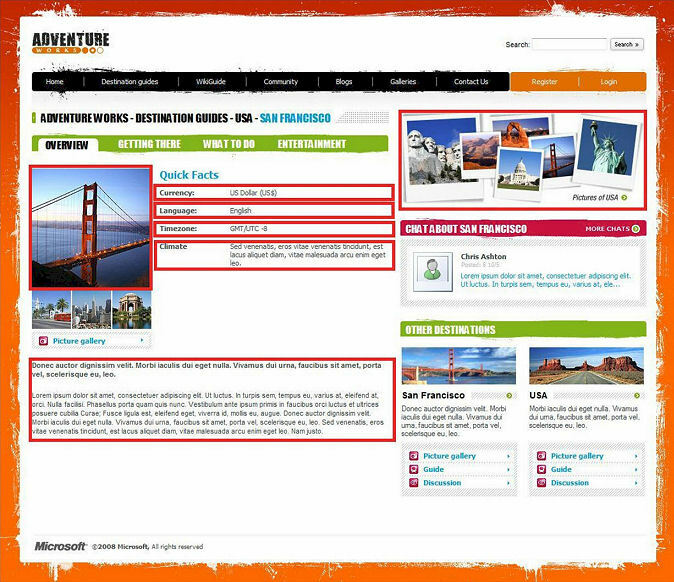 Site columns are reusable columns that are created at the site level by using the browser or SharePoint Designer 2010. A site column can be used in lists and libraries throughout that site as well as in its subsite hierarchy. A content type represents a set of fields and settings. Site columns, workflows, information management policies, and more can be associated with a content type. Just like site columns, content types can be defined by using the browser or SharePoint Designer 2010 on any site and are also inherited by the subsite hierarchy. Site columns and content types work exactly the same in SharePoint Online as they do in an on-premise installation. Generally, you declare most site columns and content types at the top-level site of your site collection in SharePoint Online to make them available throughout the site collection. See the following resources to learn the best practices of using site columns and content types. In SharePoint sites, you can create two types of pages for your content: wiki pages and Web Parts pages. Web Parts pages have been around since the beginnings of SharePoint and are still used in SharePoint 2010 by list and library view pages. However, wiki pages are recommended for users when they are creating new content pages. Creating a wiki page through the browser is as simple as clicking Site Actions, clicking New Page, and providing a name for the page. The page includes a content region, wiki linking capability, and a master page that provides a consistent appearance and all necessary components. Unfortunately, you cannot easily create a wiki page by using SharePoint Designer 2010. You can create Web Parts pages and blank ASPX and HTML pages, or you can create a page that is based on an existing master page. However, none of these techniques get you quickly to the point of entering content. To create a wiki page, either use the browser or copy an existing wiki page by using SharePoint Designer. After the page is created, you can easily modify it by using SharePoint Designer. You can dive right into the guts of the page by using the code view if you want. However, we recommend that you stay in the design view and make your changes. A typical site page might contain Web Parts, forms, pictures, tables, text, and more. You can easily insert and customize all of that by using SharePoint Designer 2010. Because the opportunities for modifying pages by using SharePoint Designer 2010 are numerous, see the following resources to explore example modifications. You can consider lists and libraries to be the core functionality within SharePoint because all data is ultimately stored in a visible or hidden list or in a library. Depending on the template you use when you create your site, certain lists and libraries are automatically instantiated. Templates for these lists, libraries, and more exist on each site so that you can create instances as needed by using either the browser or SharePoint Designer 2010. All list and library templates that are available when you run SharePoint on-premise are also available in SharePoint Online. 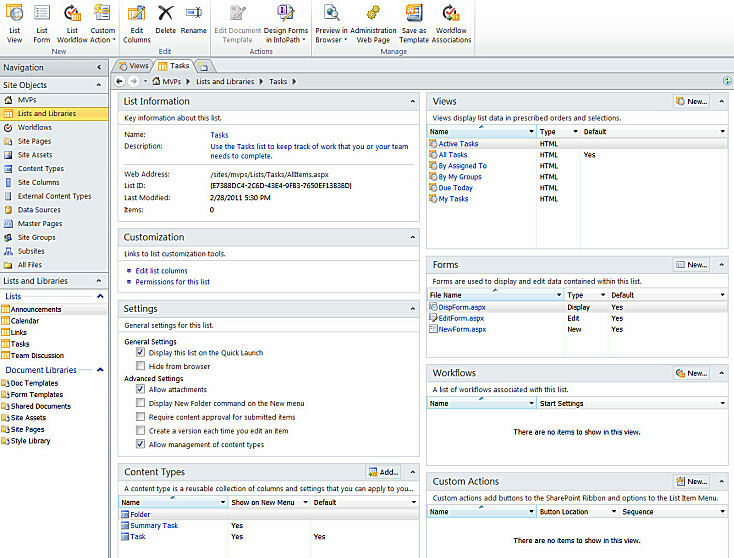 The summary page of the Tasks list (Figure 8) shows the numerous ways in which you can customize and manage settings for the list. You can make basic changes such as changing the name and description of the list. You can edit the list columns (metadata), which is commonly one of your first tasks after creating a list. The content types that are attached to this list are displayed in the Content Types section and can be managed directly from there. Any workflows that are attached to the list also appear. (See the next section for more information on workflows.) By using the Custom Actions section, you can create actions and add buttons to the SharePoint ribbon and options to the List Item menu—a task that you cannot accomplish by using just the browser. A couple of important sections in the list summary page are Views and Forms. Views are how the list presents its information to viewers of the data; forms are the main interaction point for a user to the list. SharePoint Designer 2010 makes managing both view and forms easy. In fact, many of the options for modifying view and forms are not available through the browser. (Watch the videos in the following Resources section examples.) When creating a new view or form, SharePoint Designer 2010 uses the XSLT Web Parts (List View or Data Form Web Parts) to provide a robust and customizable view of the data. Figure 13 shows a customized list view while Figure 14 illustrates a customized list form. The Settings section of the list summary page shows a subset of the most commonly set settings for lists. For example, you might want to show this list in the navigation pane of the browser, so you can select a check box to make that happen. Keep in mind, though, that not all settings of the list are visible through SharePoint Designer 2010. To get the comprehensive list, browse to the list by using the browser. Modifying your list and library views and presenting them in the best way benefits your users. SharePoint Designer 2010 is the no-code way to make that happen. One of the most robust and powerful features in SharePoint Designer 2010 is the ability to create declarative sequential workflows. You can begin using any of several included workflow templates with just a browser. However, for creating more-sophisticated functions, such as composing custom email messages or reacting to specific user-input values, you need SharePoint Designer 2010. Sequential workflows are those that follow a prescribed path with a definite beginning and end and a set of conditions and actions. SharePoint Designer 2010 provides the building blocks that you can use to create flexible and yet powerful workflow scenarios. The workflow activities in SharePoint Designer are scoped to the level of the site. Farm-level workflow activities are not available in SharePoint Designer 2010. The workflow activities that are available in SharePoint Online are the same as those in an on-premise deployment of SharePoint 2010. By using the workflow designer in SharePoint Designer 2010, you can create three types of workflows: list, reusable, and site. All are available in their full capacity within SharePoint Online. A user can manually start each workflow. In addition, the list and reusable workflows can start depending on changes to the list: when an item is created and when the properties of an existing item change. A list workflow is associated directly with a list or library and is tightly coupled with its schema. You create this type of workflow if you want to have complete access to all metadata (columns) of the list. You should create a list workflow only when you are sure that the list will not need to be relocated. A reusable workflow is intended to be moved as needed and is much more flexible than the list workflow. When creating a reusable workflow, you need to base it on a content type. For example, you can declare the document content type as the base content type of the workflow. Doing so provides the workflow with access to the site columns that are part of the document content type. On the other hand, if you had based the workflow on all content types, you would have access only to the site columns that are shared across all content types—a minimal amount of information. Whenever possible, try to use reusable workflows so that you can package them and use them anywhere within the site collection. You can even drop a packaged solution in a different site collection within SharePoint Online. The third type of workflow is a site workflow, which can be deployed as a general site-wide process. It does not need to be attached to a particular list, library, or content type like the other two workflow types. Within the site, it can act on any object (such as lists, libraries, and users within the site). A site workflow requires a manual start by a user of the site. It is available through the All Site Content page of the site. A site workflow can be created for a variety of reasons. For example, you would use it when you need to gather information from your site users and, depending on the responses, take some actions on site components or maybe send email. As part of this workflow, you can create initiation parameters that are presented to the user on the initiation page of the workflow. Information that you gather this way can then be used in the workflow logic. The full set of workflow activities is readily available in SharePoint Designer 2010. Activities such as "Check In Item," "Set Workflow Status," and "Assign a To-Do Item" provide the essential engine for all types of workflows. What if the activity you need is not in the list? In SharePoint 2010 you can use Visual Studio to create activities. After you deploy these activities as a solution package to the site collection, they appear in SharePoint Designer 2010. SharePoint Online provides the same functionality. Developers can create activities and deploy them directly to the solution gallery of the site collection. The only difference here is that in SharePoint 2010 you can also create farm-level solution packages that apply to multiple site collections. A thorough explanation of the opportunities available in SharePoint Designer 2010 workflows is presented in two comprehensive chapters in the book Beginning SharePoint Designer 2010, published by Wrox Press. 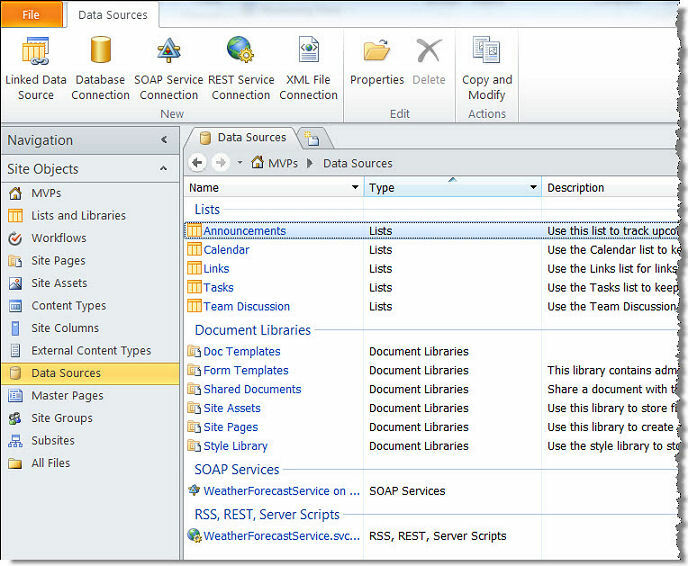 Business data does not exist only in SharePoint lists and libraries. By using SharePoint Designer 2010, you can make connections to many kinds of data repositories by using the Data Sources section in the navigation pane (Figure 9). The connections to external sources of data that you create get stored in a special hidden library named fpdatasources, which exists in the _catalogs folder of the site. These connections are scoped only to that subsite and are not shared with any other site in the site collection. This functionality differs from and should not be confused with Microsoft Business Connectivity Services (BCS). A frequent use case is getting access to lists and libraries in other sites in the same or a different site collection. For this task, you can use the SOAP service connection to target the Lists web service and point it to the site from which you want to obtain the information. The Lists web service, among other web services, is available in SharePoint Online just as in an on-premise deployment of SharePoint 2010. In addition to targeting the SharePoint-specific web service, you can make connections to talk to your partner institution's web service or any other web services available on the internet. Another service connection, the REST service connection, enables you to connect to data that is returned as the result of calling a web page rather than a web service. The data returned is usually in RSS format, which is commonly used by blogs. You can create a connection to a web page and provide the input parameters that it expects, and the page returns XML to SharePoint. Many companies and websites offer REST service interfaces. Just like the SOAP-based interfaces, you can use these interfaces to bring data into your sites. The Database Connection button on the ribbon in SharePoint Designer is generally used when working within the enterprise inside a private domain. You can target a database server and point directly to a table or a stored procedure. In SharePoint Online, you do not have access to any local databases. However, you can connect to a database that is exposed online by using its fully qualified domain name, a provider name, and appropriate credentials. Credentials for a database connection are stored unencrypted in the database connection XML file. Other owners of the SharePoint site have the ability to read these IDs and passwords. Always use an account that has the least amount of privileges required to access your data. Another source of data can be an XML file hosted either within your site or at an online location to which you have access to via the HTTP or HTTPS protocol. Any URL that returns an XML structured file works with this technique. This functionality is identical to that provided by SharePoint 2010 running on premises. You can combine multiple connections to disparate sources to display a unified view of the data. For example, data returned through a web service can be joined with data fetched from a locally hosted XML file or a local SharePoint list or library and presented as a single unit. 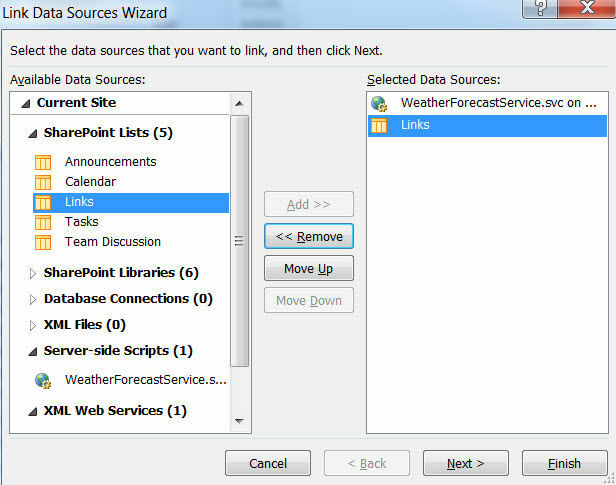 Figure 10 shows the Link Data Sources Wizard that enables this functionality. One of the most common requests that you likely receive about customizing SharePoint sites is to change the appearance of the site. There is nothing wrong with the default blue-and-white color scheme that new sites inherit. However, chances are extremely high that you will at least want to change the logo, the site colors, and perhaps the font, thus lightly designing and branding the site to match your corporate color scheme. On the other extreme, you might want to drastically change the look and feel of the site. The good news is that all these changes are doable in SharePoint Online. SharePoint branding is a vast subject. You should explore it deeply by using the resources listed at the end of this section. In a nutshell, however, branding a SharePoint Online site combines style sheets, themes, and master-page modifications. You can use SharePoint Designer 2010 throughout the branding process, but do not limit yourself to this product. Expert stylists use other tools, such as Microsoft Expression Web, Microsoft Visio (for wireframing), Adobe Photoshop, Adobe Dreamweaver, Internet Explorer Developer Tools, and Firebug for FireFox, to help create and modify various design elements. Cascading style sheets (CSS) separate content from style information. CSS is heavily used in SharePoint. The main CSS file that serves most of the styles that are visible on SharePoint sites is named corev4.css. This style sheet exists in the server in an on-premise deployment of SharePoint Server. IT professionals who manage SharePoint Server have direct access to this file. Because servers for SharePoint Online are hosted by Microsoft, this file is not directly accessible to you. However, you still have viewing rights to this file from within SharePoint Designer 2010. The easiest way to access this file is to open the home page of a SharePoint site in SharePoint Designer 2010, switch to the Code view of the page, and click one of the hyperlinked class identifiers (IDs) in the code. The corev4.css file appears in another tab (Figure 11) at the location where the style attributes for the selected class ID are listed. You can override the styles that are store in corev4.css by using your own style sheets, which you can host in your SharePoint sites. Site collection–level style sheets can be hosted at the top-level site in the Style Library. Style sheets that are scoped to a particular site can be placed in the Site Assets library of that site. Your objective should be to identify the class IDs on the page that need to be overridden (which you can do effectively by using Internet Explorer Developer Tools or Firebug), copy the existing code from corev4.css, place the code in a new style sheet (which you can easily create through SharePoint Designer), and link to that style sheet from the master page of your site. A quick way to make a change in the colors, fonts, and overall appearance of a site is to apply an included theme. SharePoint offers several themes that you can apply directly; you can also modify a theme to create a custom theme. All of this is done directly through the browser. The themes that are available in SharePoint Online are actually based on Microsoft Office, which means that if you want to create a theme, you can do so by using Microsoft PowerPoint 2010 or even Microsoft Word 2010. You can then upload to the theme gallery, which is accessible to site collection administrators. The theme is available to all site owners in the site collection. Office SharePoint Designer 2007 had the ability to modify SharePoint themes. In SharePoint 2010, the structure of themes changed significantly, so SharePoint Designer 2010 cannot modify themes. Clicking Change site theme in SharePoint Designer 2010 simply takes you to the theme page of the site in the browser. When changing the theme of the site is not enough, you need a new master page for the site. You can think of the changes that you make with a new master page as being like remodeling the whole house; changes made with a new theme are like applying new color and hanging pictures on the existing walls. Master-page changes are usually much more extreme. The ability to create or edit master pages should not be available to all users. Read the section Restrict Control later in this article to learn how to restrict this functionality within a site collection. Each site has its own master page gallery. 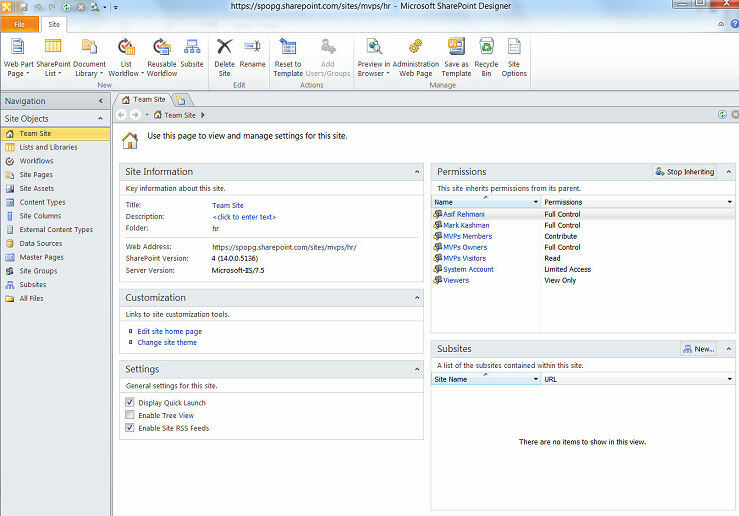 You can create master pages directly in the gallery by using SharePoint Designer 2010. The master page that is already in use by default at a team site is names v4.master. One way to create a master page is to make a copy of the existing master page and modify the copy. Then you use SharePoint Designer to set the new master page as the default master page. Another choice is to use a starter master page that contains only the minimum required components, such as those in Starter Master Pages for SharePoint 2010. Avoid creating a master page without using some kind of starter page. The reason is fairly obvious after you inspect the code of an existing master page. Dozens of content placeholders must exist to enable a master page to render properly. Even if most of the placeholders are empty, they must exist. Starting this task from scratch can lead to failure if even one of the required content placeholders is missing. When you work in SharePoint Online, you will probably use the Team Site template to create most of your sites. This template is popular because it provides many collaboration features that team members need. In addition to the collaboration features, SharePoint provides web content management (WCM), which is also known as publishing infrastructure. By enabling WCM features in a site, you can enable nontechnical authors to create and manage pages in a consistent manner that is based on available page layouts. The functions that enable WCM in SharePoint are called publishing features, which can be activated in an existing team site. The other alternative is to create a site by using the publishing site template, which has these features selected by default. Either way, the result is the availability of a new set of features that help you manage the publishing life cycle of a page. The designer of a page layout decides where to place the components (field controls, as shown in Figure 12) on the page at design time by using SharePoint Designer. Doing this controls the placement of content on a publishing page that is created by a contributor. The designer can also place restrictions on the type of content that can exist in each region of the page. For example, the designer can create a page layout that dictates that an image should be placed at the upper-right corner of the page and that a content region that allows only plain text exists in the lower left of the page. A designer might create multiple page layouts in this manner and then restrict the site contributors to using only certain page layouts to create their content. When a contributor of the site creates a page, he or she must choose one of the available page layouts, add content to the page, and then submit the page for approval. Then an approver of the site must approve the content before it is published and available for everyone to see. The page-approval process is an important part of the WCM functionality. After you use SharePoint Designer 2010 for a while, you realize how easily a person can create robust, no-code solutions for SharePoint Online. This power requires responsibility; SharePoint Designer is definitely not for all levels of SharePoint users. In fact, anyone who does not have at least the Design permission level cannot even open a SharePoint site in SharePoint Designer 2010. Site-collection administrators have complete control over all sites in the site collection by using SPD 2010. In SharePoint Online, this right cannot be revoked. This is different from running SharePoint Server on premises because a server administrator, who has access to Central Administration, can curtail the rights of site-collection administrators. Be careful whom you designate as a site-collection administrator in SharePoint Online because that person can use the full capabilities of SharePoint Designer 2010. When a site collection is created, designers and site owners of sites within the site collection have limited rights to customize sites by using SharePoint Designer. 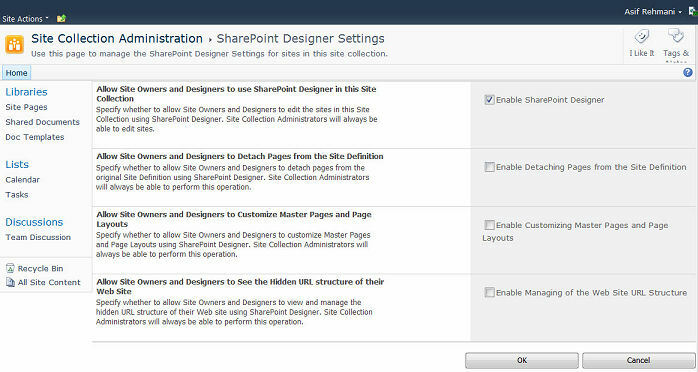 A site-collection administrator can manage these rights by using the SharePoint Designer Settings page (Figure 13), which is accessible through the Site Collection Administration section of the Site Settings page of the top-level site. Be aware that after you set the settings on this page, those settings apply to all site owners and designers. The first setting, Enable SharePoint Designer, is selected by default; the other settings are cleared. This is a good initial set of rules. Unless you can think of a good reason to change these settings, we recommend that you do not change them. In this case, the site-collection administrator has the right to do everything with SharePoint Designer; the site owners and designers do not. The following list provides a brief explanation of each setting. Enable Detaching Pages from the Site Definition SharePoint Designer 2010 allows editing of pages in normal mode (also known as safe mode) and advanced mode (enabled by selecting this setting). Advanced mode does not limit you to modifying only the content of a content zone; it lets you override the default components specified in your master page. Enable Customizing Master Pages and Page Layouts Having this right allows the user to modify the master pages and page layouts in the master page gallery. Enable Managing of the Web Site URL Structure This right grants access to all files, lists, and libraries of a site, both visible and hidden. The SharePoint Online component of Office 365 starts a new chapter in the legacy of SharePoint. Because Office 365 is designed for businesses of all sizes, you need to learn how to use no-code customizations to quickly create business solutions. SharePoint Designer 2010 has an important role in customizing SharePoint Online. Designers, site owners, and developers must acquire a thorough understanding of the available tools are appropriate before they begin building their solutions for SharePoint Online.